A range of standard sizes are available to meet a variety of handling and storage requirements, plus we offer the facility for custom-built, bespoke sizes to suit any specification. Spot welded construction from galvanised steel. Purpose made racking is available on request for all ranges of tote pans. Range includes stacking and nesting pans and as optional extras these pans can be embossed with the company name and can come with cardholders at each end, slide-on lids and perforated bases. Designed for constant visibility of stock. Designed for Euro range of Work Pans / Euro Containers for easy movement of loaded pans. Transport or store goods safely in trolleys or racks. Compact storage of black polypropylene containers 600 x 400 x 150mm, capacity 25kg each container. 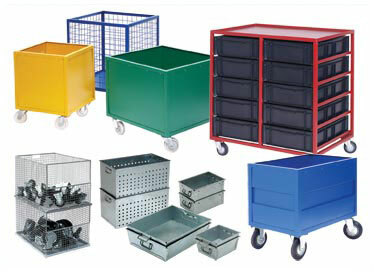 Transport bulky items with ease or store between work processes. Manufactured from galvanised sheet metal with sloping top for indoor/outdoor storage. Move or store heavy bulk items with ease - capacity 500kg.